Below is list of the most frequently asked questions. In addition, you will find our advice line numbers, should you need further assistance. *The information and commentary on this website or in any response to a query is provided free of charge for information purposes only. The information and commentary is not intended to amount to legal advice to any person and must not be relied on as such. We try to make sure information is accurate at the date it is published. However, there may be developments after the date of publication that means the information is out of date. 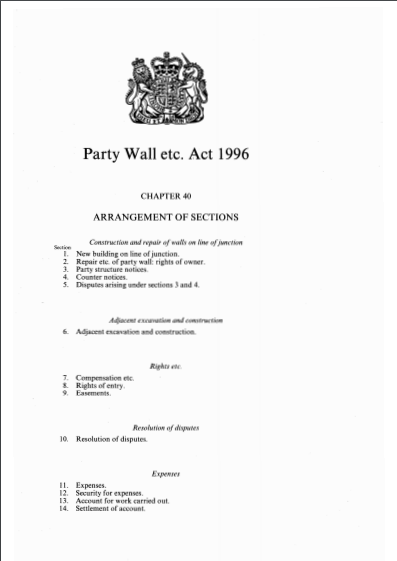 This Faculty guide provides an overview of the Party Wall Act and its implications for building owners. A quick reference flowchart, showing the steps required when considering the Party Wall Act. The Party Wall etc. Act 1996. What happens if I do not serve a notice as required under the Act? The Act carries no fines or penalties but it is possible that the adjoining owner may apply to the court to have an injunction served in order that you will stop work. What happens if the adjoining owner does not reply to the notice within 14 days? Under section 1 of the Act, where you wish to build a new wall on the line of junction, you will have the right only to build on your own land. In respect of a notice served under sections 2 and 6 of the Act, if there is no reply to the notice after 14 days then a dispute is deemed to have arisen and you and your neighbour must appoint a surveyor. If your neighbour still fails to respond, then after giving a further ten days to reply, you may appoint a surveyor on his behalf. What happens if I do not agree with what my appointed surveyor is doing? You are unable to rescind his appointment but you can approach the third surveyor to resolve the matter for you. However, if you have chosen to have just the one surveyor called the ‘agreed surveyor’, then there is no third surveyor to call upon. This is why you should take care in selecting a surveyor and more particularly as to whether you just need the one ‘agreed surveyor’. Do I have to inform my neighbour if I am just putting up bookshelves or fixing electrical socket outlets to the party wall? This sort of work would be considered to be minor and such works would not need to be notified under the Act. What do the surveyors do? Who pays the surveyors' fees? As a building owner, do I have the right of access to my neighbour’s property to undertake the work, and as an adjoining owner do I have to grant access to the building owner to undertake the work? If a surveyor has been appointed you must take his advice. There is a right of access within working hours on notice, but only if it is to undertake the notifiable work in accordance with the Act. If you are in doubt on this, you can by notice require the building owner to set aside an amount of money, as agreed between yourselves or determined by the surveyors, as security that would allow the works that affect you to be completed. Does the Act override other legal rights? Common Law rights are restricted by this Act where the Act would take precedence on any matter for which it makes provision. Any other rights, easements or covenants for example, are not affected. The Act is not there to resolve such matters and the surveyors do not have any power to do so. Practically speaking in the event that the boundary is not agreed the Act cannot be applied until the matter is resolved. This would not apply in the case of a section 6 notice, which only deals with an excavation within a certain distance of the adjoining owner’s building or structure, and in this case the position of the boundary is irrelevant. If you can't find the information you need and have a Party Wall related question, then please call our advice line. The Faculty advice line is provided by a number of our experienced and knowledgeable members, below you can find their names and contact numbers. Note the advisors are working, busy surveyors and may not be available when you call, but please leave your details and they will return your call.